It really feels very wintery at the moment and we had a large fall of snow over the weekend. So much snow in fact that it was impossible to drive up our hill by car and we had to be rescued by our son on the newly acquired quad bike! Sadly the weight and abundance of the snow has wreaked havoc with our wonderful old pines on the banks. Many large branches just could not take the strain and have fallen crushing everything in their wake. A massive clear up is underway and we will have to wait and see how bad the damage really is. Luckily the summer house half way up the banks remains intact but I fear a lot of shrubs will have to be replaced in the spring. The only good thing is that it will let in more light on the banks and we were very fortunate that an entire tree did not fall. Just missed the Summer House ! Our Christmas tree has arrived and daughter Clare and I will be decorating it today. A wonderful smell pervades the house and can’t wait to see my little grandson’s face when it is decorated and lit. 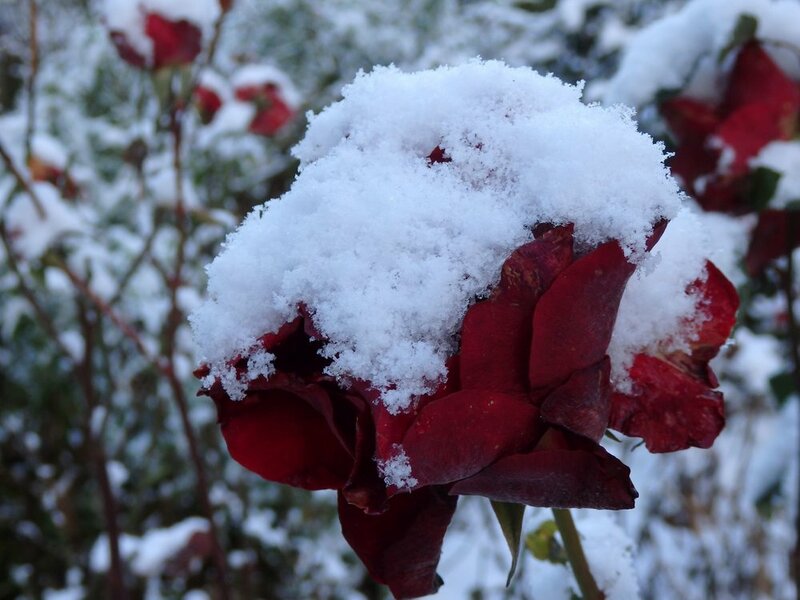 Johnny took advantage of the snow covered garden and took some beautiful photographs. 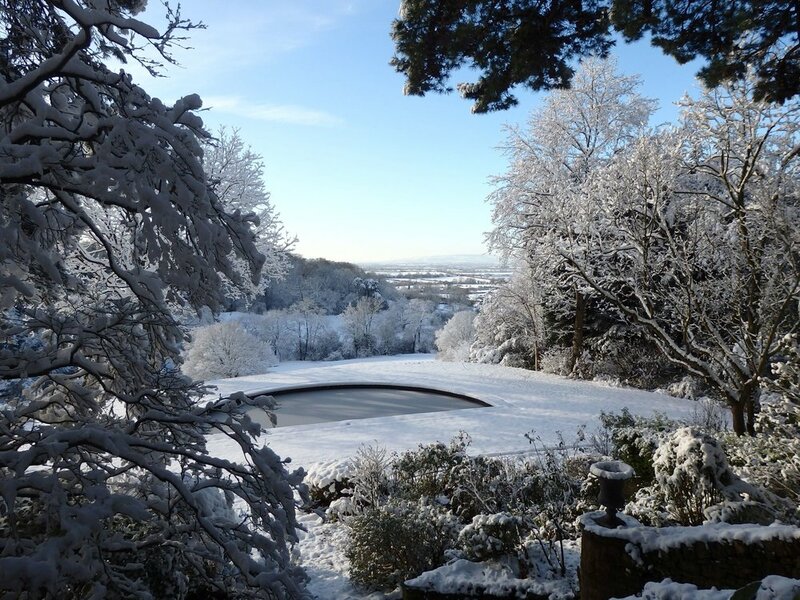 Visitors always love to see what the garden looks like in winter and this was the perfect opportunity to capture new images, sparkling clear light and a winter wonderland. Christmas is nearly upon us and we have all the family here, a time to be in doors but come the New Year there will be a lot of work to do in the garden. Almost the end of another year so it only remains for me to wish everyone a Very Happy Christmas and a good gardening New Year. It is that time of year to put into action all the decisions we made in the past few months. The prunus hedge which is by the entrance to the garden has been dying off gradually and we have decided to remove it completely. Instead we are going to plant an escallonia apple blossom hedge which is evergreen and will produce lovely pink flowers in the summer. The soil has to be improved and the magnolia cut back which overhangs the drive so as always one job leads to another. We have also, after much deliberation, decided to cut down the silver birch in the wide border. This was planted by my mother in the 1970’s and is at its best in the winter. However it makes that end of the wide border incredibly dry and shady and nothing seems to be thriving underneath. It will require the skill of the tree surgeon and a stump grinder but feel the area will really benefit from more light and moisture. It will be fun to see how many people notice when we re-open in the Spring! We have been busy updating our guide book with a new map and inclusion of the now opened orchard and mound area. The map was created by a friend of my daughter, Lucy Panes, with a fresh and attractive design which we hope will be appreciated by our visitors. We have also included updated photographs and keeping fingers crossed that we have spotted all the spelling mistakes and errors before it goes to press next week. I am not doing a lot of gardening at the moment as Clare and baby Jack are in residence which is wonderful. He is now four months old so really taking in his surroundings and seems to have adapted to the English way of life with lots of fresh air and exercise. Luckily we managed to plant all the bulbs before they arrived back home and the gardeners are progressing well cutting over the borers with dry mild weather at the moment. Closed again for the winter and with a large amount of growth this summer there is a lot of cutting back to do. This is also the time when we take stock of the borders and decide to remove completely one or two large shrubs which have passed their sell by date. Philip has at last finished the hedge cutting and his finale were the four box domes in the white sunk garden. With our new extension through the orchard we have created more hedge cutting work for him and even the rugosa hedge around the mound has had a very hard haircut. We had decided that the lower lawn around the swimming pool was getting very worn and brown so immediately we closed Teal Turf moved in to completely re-turf this area. Not such an easy task as with everything in the lower garden all had to be transported down through the park and up over thehaha. Luckily we had a dry week and now the grass is looking emerald green and will be an improvement for next season. 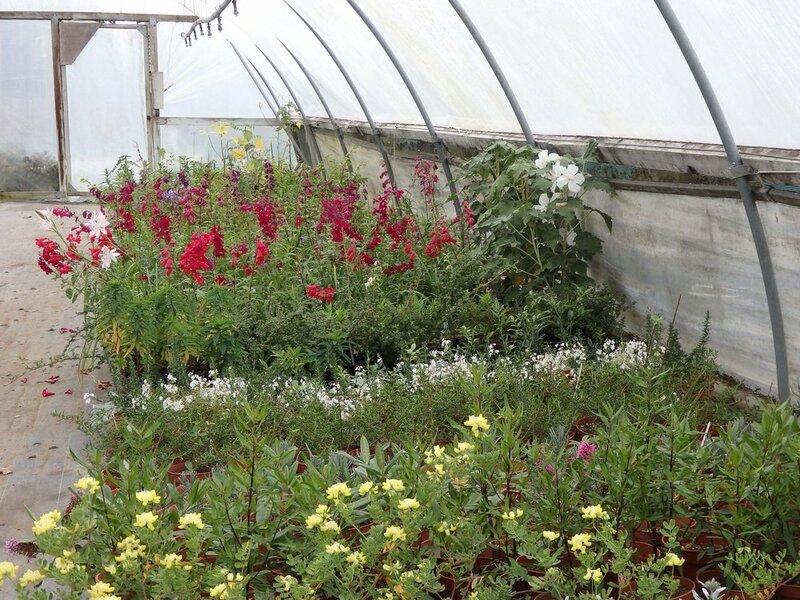 The nursery has been skilfully put to bed by Tom and the greenhouses and poly tunnel full to bursting with slightly tender plants in case we have a cold winter. The dahlias are still in full bloom and are a joy to pick and bring into the house. The chocolate cosmos has been in full flower now for months, it is not hardy so we will lift it, keep it dry over the winter and split it in the spring. Cosmos of all colours are such a good value annual and have really added to the borders during late summer and autumn. We have recently had very good news that daughter Clare and David plus baby Jack are all returning to the UK in early November. David will be working in Aberdeen but we will have the bonus of Clare and Jack here till Christmas until they have found a house and settled back to life in Scotland. The equinox approaches and it is feeling very autumnal with rain and wind but nothing like the terrible hurricanes in the Caribbean. Not long until the end of the season but the garden still has a surprising amount of colour provided by the asters, dahlias and salvias. On the subject of dahlias I bought a selection from Sarah Raven back in the spring and have been trialling them in the kitchen garden. They have flowered really well and there are quite a few dark purples and reds that we will be adding to the borders next year. The Sculpture Show is now finished and was I think a success. All who visited enjoyed the selection of sculptures made by the Oxford Sculptors Group and we were very lucky with a glorious August Bank Holiday weekend when we had a lot of visitors. 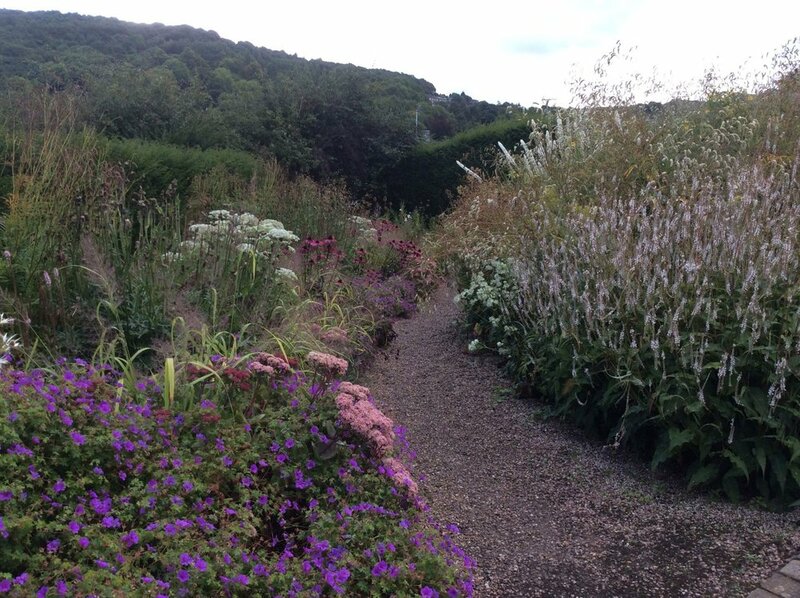 We have just returned from two nights in Yorkshire as we realized that because we have been so busy we had not visited many gardens or nurseries this summer. We firstly went to Dove Cottage nursery and garden which was recently on Gardeners World. What a treat was in store with a wonderful selection of plants and a stunning garden at this time of year. We came away with a car load on new additions and some really good ideas for our wild area. Then on to Newby Hall which is a magnificent large garden with a vast double herbaceous border which has been completely re-planted over the past five years. It also has the cornus collection and many rare and unusual trees and shrubs and, like here, is watched over carefully by the present chatelaine Lucinda Compton. We have had an excellent season this year and are now looking forward to putting into practice all our plans and ideas for next year. The agapanthus have been the stars of the past few weeks. There are so many different varieties, small and large, white and blue, they are a brilliant addition to the garden in late summer. We leave ours in the ground over winter and do divide them when necessary. They don’t like winter wet so plant them in a dry spot and they will flourish and give weeks of pleasure. Pruning and cutting back continues throughout the season and the whitebeam arch, sorbus aria lutescens, that my mother planted back in the 1970s needs several trims a year. It has been much admired and copied over the years and gives a wonderful contrast of silver leaf colour against the dark yew hedges. I had a fantastic week in America and arrived just in time for the birth of our grandson Jack. He is perfect and growing daily. Daughter Clare is also doing well although I don’t envy those sleepless nights! Now into the last two months of opening, it is such an advanced season with the hydgrangeas and anenomes full out, luckily the jet stream has moved so more rain is forecast, good for the garden but not for holiday makers. What a contrast to last year when we had low temperatures and plenty of rain in June and early July. Since I last wrote we have had a blistering ten days of heat when everything has burst into flower but faded far too quickly. Now we really badly need some rain as everything is a good fortnight earlier than normal with hydrangeas and Japanese anenomes beginning to flower in early July instead of August! I am already worrying what there will be to come in the autumn! The one group of small tree or large shrub that has performed really well are the cornuses, one of my favourites. The cornus ‘Kenwyn Clapp’ on the side of the car park has been much admired, starting with large white flowers it then progresses to a deep pink and has been in flower for over a month. The perennial wild flower meadow has changed completely from May and now some of the scabies, umbellifers and later wild flowers have come into their own. We are continuing planting plugs in here and it will be interesting to see how this area progresses. The roses were wonderful but as I said earlier lasted far too short a time and the Kiftsgate rose has never flowered so early. It is now over and we have been doing a lot of dead heading. Quite a few will come again and I am particularly pleased with rosa Vanity which I planted last year and is already climbing into the magnolia at the end of the wide border. Lobelias are a really useful end of summer family and the lobelia bridgesii is looking particularly good at the moment. We have also planted L. Queen Victoria and Russian Princess. L. Fanfare Scarlet and Hadspen Purple survived well in the borders over the winter and add a good splash of colour in August. Keeping fingers crossed for some rain whilst I am off to America next week to await the birth of our first grandchild, a very exciting prospect. I knew it was too good to last and this week we have been hit by gale force winds and torrential rain, not what you want in June. Amazingly the garden has stood up to natures forces very well but the herbaceous peonies have not lasted as long as usual and the abutilons in the lower garden have been sorely tested. The perennial meadow has been looking lovely with the allium purple sensation and the yellow buttercups making a wonderful display. Next week we will be dead heading the buttercup and digging up quite a few, otherwise all the other wild flowers will be overcome and choked by them. Our new oak benches have arrived for the new mound area and look terrific. Nicky Hodges who has made all the seats and benches in the garden has done a brilliant job and it is lovely now to be able to sit and enjoy the vista up the tulip tree avenue to the sculpture, (not that we do very much sitting!). The bush honeysuckles which are always much admired in the garden are flowering well and the combination with the dark purple campanula and pale lilac geranium robustum make an attractive grouping in the four squares. Visitors often comment on the colour combinations in the garden and this is very important to us although sometimes it is more by luck than skill. Visitors from as far afield as Finland and Argentina are visiting us at the moment and we are preparing for our most hectic time in the garden with lots of buses and the much anticipated flowering of the Kiftsgate rose. What a dry Spring, we really need the rain now to bulk up everything and refresh the garden. Having had such a hot April it is now much cooler with an easterly wind which is unusual and again very drying. Our big excitement is the opening of our new garden area which we have been working on for a few years and is now nearly finished. This came about after we had made the modern pond garden in 2000 when we had one thousand tons of soil dumped in the orchard. We have moulded it into a horseshow shape which has been turfed. Rosa rugosa roses in pink and white form a hedge around the outside of the mound and the outside slope has been planted with a prostrate cotoneaster to hide the black plastic covering. A tulip tree avenue was planted five years ago which leads to a statue by Pete Moorhouse of a leaf in stainless steel with veins replaced by an Islamic pattern taken from the Huand Hatun mosque in Kayseri, Turkey. Inside the horseshoe is a chevron pattern of coloured stones and four olive trees planted in containers which we bought for our daughter’s wedding! Leading from the fern border you walk through a perennial wild flower garden with the established cornus controversa Pagoda and a very productive plum tree presented to us by the Worshipful Company of Fruiterers. On through a new iron gate you enter the orchard with old and new fruit trees. Camassias and tulip Jan Reus have been planted in the grass and will be continued to be added to over the next few years. I am delighted with rosa La Follette which is flowering really well and covering the roofs of the ladies loo! Such a stunning tender rose which I first saw in the South of France and never thought would flourish here in our colder climate. 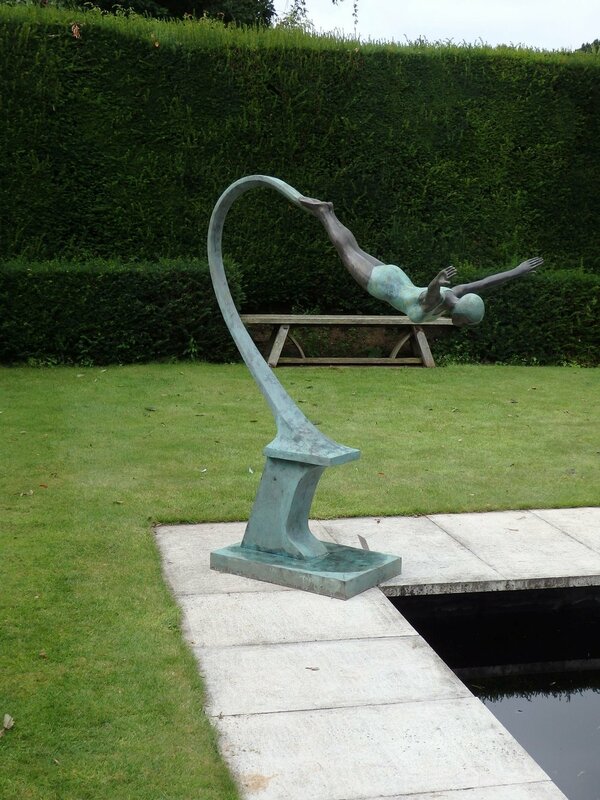 Looking ahead we are hosting a sculpture exhibition by the Oxford Sculpture Group from Saturday 19th August until Wednesday 6th September. Around one hundred pieces will be displayed in the garden and their website for more information is www.oxfordsculptors.org . Perhaps it is my memory lapsing but I cannot remember such a wonderful spring! Really warm temperatures and no frost so the magnolias were magnificent and everything has burst out almost three weeks early. We now need a little rain but as it is Easter weekend it can wait until next week. The bluebells are unusually early and looking stunning. They will nearly be over by the beginning of May when they should just be starting. Not a daffodil left but again they flowered brilliantly, in fact everything has performed above and beyond to make this spring so special. This year I planted a new variety of tulip in the pots called Purple Dream and as you can see it is looking lovely. Some of the other tulips are not as tall as normal but I am putting this down to the lack of rain. The ballerina tulips in the yellow border have flowered again from last year which is very encouraging as so many come up blind in their second year. As I mentioned earlier in my diary we pruned the roses extra hard this year and you will see from the photo how we train them into different shapes with iron and wooden structures. I went to an excellent lecture at The Gardens Illustrated weekend at Westonbirt and heard Troy Scott Smith head gardener at Sissinghurst give a talk about all the roses that they have replanted and replaced there. He was saying that they too use this same system to “pull” the new growth down horizontally to increase the number of flowers. Just a reminder that the season ticket at £22.00 is an excellent way of seeing the garden throughout the season and by May we will be open five days a week. Only a few days till our opening at the beginning of April and quite a few last minute jobs to be done before we are completely ready for another season. As it was raining today I tackled the shop which I emptied in October and stored away over winter. A mass of large boxes have been delivered over the past weeks with all the new stock so it was rather like Christmas, unpacking all the items, pricing them and then re arranging in our tiny space ready for opening. I had a very enjoyable day out listening to Sarah Raven talking about her cutting garden at Perch Hill. A completely different kind of gardening to here but still learnt a lot especially about annuals and dahlias. I had no idea there were so many varieties, shapes and colours of dahlias and came away with a selection from her pop up shop to experiment in a dahlia bed in the kitchen garden. It is always stimulating to get new ideas and at the same time be supporting an excellent charity, the Gynaecological cancer fund Lady Gardener Campaign. The garden is really moving now with the daffodils out and leaves appearing on the trees. The armandii clematis around the small pond in the lower garden is flowering spectacularly after our relatively mild winter. I love this time of year with all the promise of things to come and the evenings getting lighter. Talking of things to come, I have been pollinating the apricot and nectarine trees in the greenhouses with a rabbit’s tail. This is a really old fashioned pastime but very effective for a bumper crop in the summer. The blossom is so pretty and at this time of year bees are scarce so it just helps ensure success. There is nothing better than a home grown apricot or nectarine warm from the tree, something again to look forward to! We have cut over all the penstemons and am just about to prune the summer flowering ceanothus and tender buddleija crispa. There are paths to be swept and this year in particular with the high winds the leaves have been particularly abundant and seem to get everywhere. Expectations are high for a wonderful gardening year and am much looking forward to welcoming our first visitors on April 2nd. Home again after a wonderful break in the sunshine; warmth on the skin and no thoughts of gardening! I visited the RHS Spring Show in London last week for the first time in years and much enjoyed the intimate atmosphere and displays of spring bulbs. Some excellent nurseries were displaying including my favourite lily nursery H.W. Hyde and Son. Also Avon Bulbs with a vast array of snowdrops with price tags to match! I fell for some reticulate irises and a beautiful new hellebore called Ice Cream which is now planted by our front door. Robert our son has taught himself (with help from the internet!) the basics of dry stone walling. He has started on an old wall that had collapsed surrounding our log yard and any weekend he is home will find him there. A public footpath runs alongside the wall and walkers and well-wishers stop to give encouragement and advice. Apparently the most common bon-mot is ‘once picked, never to put down a piece of stone until a place has been found for it in the wall’. Great progress has been made and rather like a jigsaw it is all coming together. I visited my first NGS garden this year on Sunday at nearby Stretton on Fosse. A lovely mild weekend and lots of people out and about. My good friend Penny has created a wonderful winter garden which was looking stunning and full of interest and colour. The scent from her daphne Jacqueline Postill was fantastic and filled the air, surrounded by hellebores and early spring bulbs. A real treat and very clever to have so much to see so early in the season. We are busy preparing for another season too. The swimming pool has been re-painted, the tree surgeon has been and gone and the large terracotta pots have been unwrapped to reveal the tulips poking through the soil .Everything is on the move, as must we! A very Happy New Year to everyone. We had a busy Christmas with five children under four years old staying so as you can imagine lots of noise and fun! Now into January which so far has been damp and grey with the occasional hard frost but no snow so far. We did a count of all the flowers in the garden on New Year’s Day (see photo) but were slightly dismayed to see in the newspaper that on Tresco in the Isles of Scilly they had over three hundred plants in bloom! We could only manage around twenty. We worked off our Christmas excess by digging up brambles in the bluebell wood, luckily a sunny dry cold period, but as it faces south we were stripped down to our shirtsleeves even at this time of year. It is amazing how they grow each year even though it is an annual chore, but worth it as otherwise they would choke all the bluebells which are spectacular in May. We are off to warmer climes next week as have been asked by some friends to their house in the Caribbean, very spoiling and am looking forward to some warmth and recharging our batteries ready for another season. The gardeners are progressing well with the pruning and digging over of the borders and are just about to tackle the steep banks which are covered with pine needles after the gales. The pines are magnificent but they do have the drawback of the needles which seem to scatter themselves everywhere at this time of year. Hopefully by the time we return the snowdrops will be out and the evenings that little bit lighter so we will be on the run up to Spring.